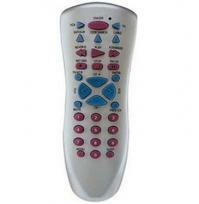 Universal Remote Control, Controls TV, VCR and Cable Box, Menu key, Code Search, Code Saver, Includes Batteries. 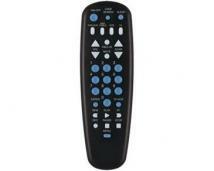 Controls 4 Remotes in 1, Controls TV, VCR, Cable Box and SAT/AUX, Menu key, Code Search, Code saver, Universal DBS codes, Extensive Code Library, Sleep Timer. Dimensions: 1.8in L x 4.2in W x 11.1in H.
Universal Remote Control, Controls TV, VCR, Cable Box and SAT/AUX, Menu key, Code search, Code saver, Universal DBS codes, Partially Backlit Function Keys, Sleep Timer. 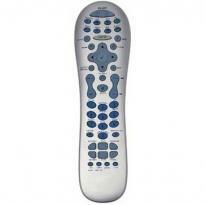 Controls TV, VCR, DVD, satellite/cable, audio and DVR/AUX, Advanced DVD & DVR functionality, Advanced TV functionality including HDTV, Macros, 4 programming methods: direct entry, manual and automatic code search, brand search, Sleep timer. 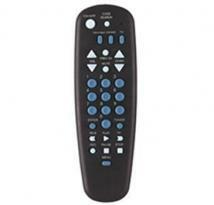 Controls TV, VCR, DVD, satellite/cable, audio, DVR, Aux 1 and Aux 2, Controls most brands of TV, VCR, DVD, DBS/Satellite, audio and cable, Advanced DVD & DVR functionality, Advnaced TV functionality including HDTV, Macros, 4 programming methods: Direct entry, manual and automatic code search, brand search, Sleep timer.